For Americans looking for that good old All-You-Can-Eat, but Probably-Shouldn´t experience akin to Bonanza or KFC, Siga La Vaca Restaurant in Buenos Aires (literally, Follow the Cow) provides an exceptional opportunity to eat far more than you pay for. I came here with four friends and left thoroughly stuffed, a little drunk, and desperately wanting a bed to pass out in all for approximately 12 USD. Here in Argentina places like these are called ¨tenedor libre¨(literally, free fork). However, compared to their counterparts in the United States they offer a little more class, a lot more taste, and far more in terms of quality. It doesn’t hurt that Siga La Vaca isn’t located in the parking lot of giant strip mall, but on a nice avenue in the Puerto Madero neighbourhood of Buenos Aires: an area known for restaurants, bars, clubs, and some beautiful streets with views of the river and docks. None of us had eaten all day, so we decided to show up unfashionably early, which here means before 10pm. The dining room was quite large, its centrepiece a twin-barred salad buffet. We chose one of the many empty tables and plopped ourselves down. Immediately, our waitress came over and asked us we knew how the restaurant worked. We didn’t, so she explained it to us in so many words: You can get up whenever you want and get as much food as your body can physically handle. This includes the salad bar and the BBQ pit, complete with various cuts of meat from cows, chickens, pigs, and miscellaneous animals. At the end, if you are still breathing you get one dessert. Bathrooms are free and the napkin supply is unlimited. In addition to food each person gets unlimited bottled water (with or without gas) and either an entire bottle of wine or pitcher of soda. Again, each person gets either a full bottle of wine or a pitcher of soda. I know! We had to ask our waitress to clarify this a number of times because we couldn’t believe it. We all started slowly, trying to pace ourselves to see if we could really make a dent ; only two bottles of wine for now, thanks. 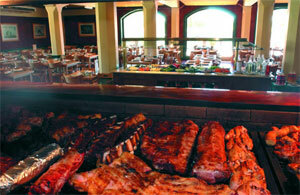 I started with a sampling from the salad bar and some cuts of vaca (cow) and cerdo (pig). Just getting the meat was exciting. There is a mammoth grill with heaps of all the meats on it. One guy has the gruelling job on constantly stoking the grills with charcoal, while another is in charge of throwing the meat on. There is an attendant who stands behind a counter and cuts the meats you ask for right in front of you. By the end of our first round the place had filled up. At this point I was eating pitted olives in an effort to force myself to eat more slowly. I saw a table of kids from the hostel I had been staying at. One guy was on his fifth steak. Ridiculous. We ordered two more bottles of wine and another round of meat and salad. One of my friends got a pitcher of coke. I still don’t know why. It was now close to 10:30pm. We had been in the restaurant for two hours. Not only were we late to meet friends at a bar, but now people were crowded in the waiting room, ironically, not unlike cattle in a coral. Always looking for the bargain, I dug deep inside myself, pushed aside the partially digested food and made way for my dessert, which this time happened to be chocolate ice cream with some sort of chocolate mint sauce that was partially solidified. However, there were other options. I think I saw flan, but my eyesight was blurring at this point. Close to comatose and suffering from the warm fuzzy feeling that comes from saturating your blood stream with food and wine we all made our way out onto the street and made the walk from Puerto Madero to San Telmo to meet friends. We wanted to exchange high fives, but we could not raise our arms because we had followed the cow so hard. You should really just buck up and punish your GI tract, but if you are still hungry for a little more info check out their website that describes in more detail their menu, history, and philosophy. 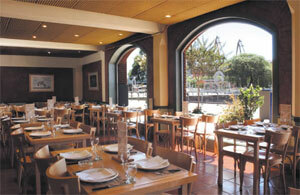 There are currently five Siga La Vaca restaurants in Buenos Aires. As long as my clothes still fit, I plan on trying the remaining four. This page rendered in 0.372 seconds.